Clothes rack pine 2 knobs with profile manufactured in solid natural beech wood. They can be varnished, lacquered, painted... Consult prices. Measurements 30 x 9 x 2 cm. Clothes rack 2 knobs with profile manufactured in solid natural beech wood. They can be varnished, lacquered, painted... Consult prices. Measurements 30 x 9 x 1,5 cm. Clothes rack 3 knobs with profile manufactured in solid natural beech wood. They can be varnished, lacquered, painted... Consult prices. Measurements 40 x 9 x 1,5 cm. Clothes rack 4 knobs with profile manufactured in solid natural beech wood. They can be varnished, lacquered, painted... Consult prices. Measurements 50 x 9 x 1,5 cm. Clothes rack pine 3 knobs with profile manufactured in solid natural beech wood. They can be varnished, lacquered, painted... Consult prices. Measurements 40 x 9 x 2 cm. Clothes rack pine 4 knobs with profile manufactured in solid natural beech wood. They can be varnished, lacquered, painted... Consult prices. Measurements 50 x 9 x 2 cm. 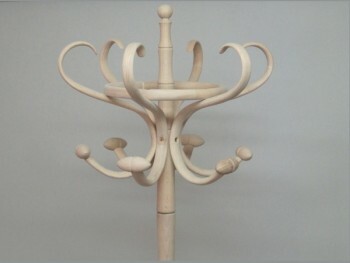 Curved coat stand manufactured in beech wood.